Ascending Butterfly: Make the Lancer Method YOUR Method - Win the LancerRX daily 3-step program! Make the Lancer Method YOUR Method - Win the LancerRX daily 3-step program! This giveaway is now CLOSED. Thanks so much to our wonderful sponsor Lancer RX! We look forward to working with you again! The winner has been notified and upon confirmation, follower name will be posted here. Remember: There are great giveaways active on the upper right hand side of the page! Watch for the next bag in the ‘Slip Into Summer' series to launch SOON. This summer has been hot enough to fry an egg on the sidewalk, and it has just begun. I don't know about you, but the heat and the excessive sweating it produces, leaves my skin particularly my face, feeling less than pretty. The sweat causes product to run and tends to clog my pores. And while I don't suffer from sensitive skin in any way, I do find that my skin is more reactive in summer than any other season. I try to combat it every year with the 'less is more theory' of summer product usage, but let's face it, life usually speeds up in the summer, it certainly does NOT slow down. I have been attending MORE events this summer than ever somehow, which means that tinted mouisturizer alone was NOT going to cut it for me. I've had to constantly put my best 'skin forward' from day into night all week long (and quite a few concurrent weekends) and in doing so, it's required more effort on my part. There are one of two types of ladies out there, the ones that HAVE to wash off every last trace of makeup before bed and the ones whose heads hit the pillow even if they have make up on. I am lady number one. I can't go straight to bed without getting the make up off. And when I clean my face, I want it to feel clean and not every product leaves me with that feeling after I use it. And my litmus test with facial products has always been the same. If I feel the need to use an astringent after I've cleansed my face, that product did NOT do the job in my book. I'm happy to say that I found my 'squeaky clean feeling' solution! And it's as easy as 1, 2, and 3! I have been using the Lancer Method and will admit my face is becoming quite spoiled! I've had the opportunity to try quite a few products since I've started on this roller-coaster ride called 'blogging', but I very rarely get nervous about what is going to happen about when I run out. This time, I am. 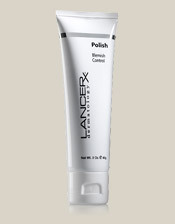 The Lancer RX Polish is an advanced exfoliator, removing dull, dead skin cells and leaving the skin noticeably smoother and more radiant. The Natural Sea Minerals immediately energize the skin without causing redness (even for people with roacea) and prepare it for effective cleansing. Once the skin is rid of debris, it is ready to be cleansed. 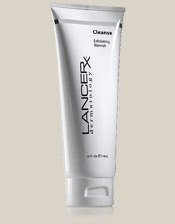 The Lancer RX Cleanser washes away impurities & environmental toxins while bringing a uniform freshness to the skin. After the skin has been polished and prepped it is time for repair. The Lancer RX AM/PM Nourishing Treatment increases firmness, diminishes the appearance of lines and wrinkles and nourishes the skin with essential botanical extracts and powerful antioxidants. For acne prone/oily skin types like me, I just wanted to pointed out that I also tried the Polish - Blemish Control, it is a gentle resurfacing polish containing natural exfoliating minerals from the Dead Sea and antibacterial Tea Tree Oil. 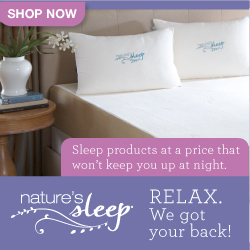 This product removes surface skin cells while natural tea tree oil provides antibacterial action. This product preps skin for the Repair Treatments (the third step). It leaves skin smoother, refined and with improved clarity. I am a long time believer in the power of tea tree oil for acne prone skin, and was delighted to know that Dr. Lancer's Polish Blemish Control contains this ingredient already, because I have been adding tea tree oil to other products for years! The Skinny: I really love this system, Step 1 is by far my favorite, it gives me instant gratification, I can literally feel a huge difference in my skin after using it. My face just feels truly clean there is no other way to describe it. It's a deep clean feeling, that does NOT strip my skin of it's own mouisture or leave it dry. Most products, especially for acne/oily prone skin has a tendency to dry out my face even when I follow the instructions to the letter, these products don't do that. I have certainly noticed the improved clarity that is promised as well. I find my skin is clearer, and more radiant and I'm not going to be a happy camper when I run out, which as far as I'm concerned, says it all! When I tell you I would buy it even though I have access to a variety of skin care products, trust me, it's high praise indeed. These products are paraben and cruelty-free! And please don't think this is Ladies only, I will have you know that a November 2008 issue of People declared that the 'Sexiest Man Alive, Hugh Jackman, swears by Lancer RX Repair' - now guys if that's not a ringing endorsement of being serious about your skincare, and about trying out these products, I don't know what is! Ƹ̵̡Ӝ̵̨̄Ʒ - WIN IT! - Ascending Butterfly and our friends at Lancer Dermatology and ID-PR would like 1 Ascending Butterfly Follower to put their best skin forward this summer by winning a Lancer RX Method of their very own! Don't you just ♥ Lancer Dermatology? I know I do! Ƹ̵̡Ӝ̵̨̄Ʒ - How to Win: (1) You must be a PUBLIC follower of Ascending Butterfly to be eligible for this and all giveaways. Indicate in your entry that you follow (if your 'comment name/user id' differs from your profile id, please let me know what name you follow under) and (2) Visit lancerdermatology.com and pick a product you like and leave the URL LINK to that product in your comment entry! (3) You must also leave your email address somewhere in your comment. (You can format it this way for security, example: ascendingbutterfly AT mail host DOT com). (If your email is clearly visible in your profile, you can just say so, that's OK!) Please follow the easy 1, 2, 3 steps to winning This giveaway is open to USA residents who are 18 years of age or older. If this is a duplicate please delete but your ads messed up my last entry. I Follow/Like Ascending Butterfly on Facebook. I'd love to try the Extremely Pure Cleanser. 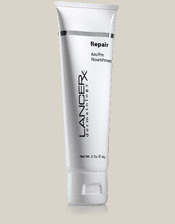 I would love to try out the http://www.lancerdermatology.com/ecomm_products_details.php?id=4 thanks!